Thank you to everyone involved in the World Premiere production, and especially to all who came out to see the show. We enjoyed four completely sold-out performances and received very helpful feedback about the show. Stay posted for information about the upcoming cast recording! We’re proud to announce the cast for the Basement Arts production of Placebo! 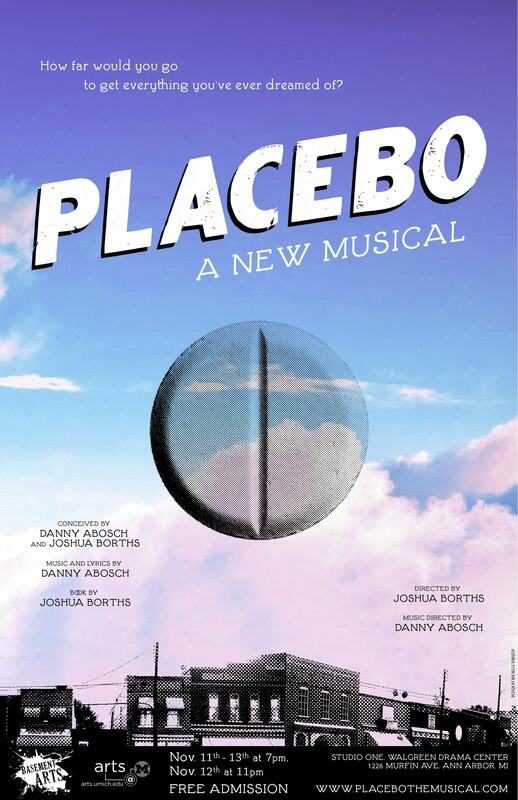 Audition for the premiere production of Placebo! Click here for the information. Announcing the World Premiere Production! We couldn’t be more excited to announce the first ever performance of “Placebo”. It will be produced by Basement Arts at the University of Michigan this November 11th-13th. Tickets are FREE on a first-come-first-serve basis. Check back here and at Basement Arts’ website for more information, and feel free to email us with any questions!